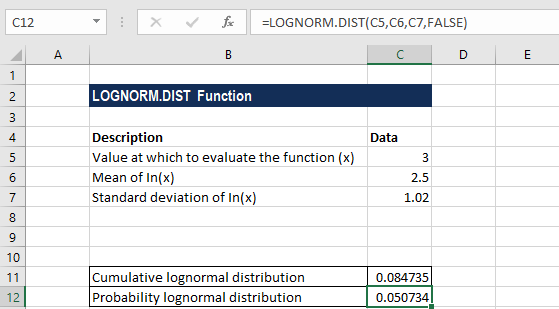 The LOGNORM.DIST Function is categorized under Statistical functionsFunctionsList of the most important Excel functions for financial analysts. This cheat sheet covers 100s of functions that are critical to know as an Excel analyst. 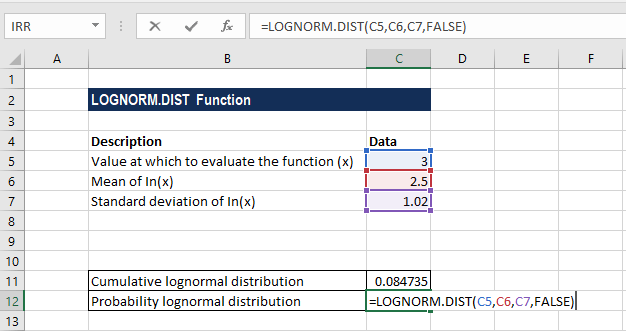 It will calculate the cumulative lognormal distribution function at a given value of x. We can use the function to analyze data that‘s been logarithmically transformed. A variable x is log-normally distributed if its natural logarithm is normally distributed. Where μ is the mean of ln(x) and σ is the standard deviation of ln(x). In financial analysisFinancial Analyst Job DescriptionSee a real Financial Analyst Job Description including all the skills, experience, and education required to be the successful candidate for the job. Perform financial forecasting, reporting, and operational metrics tracking, analyze financial data, create financial models, the LOGNORM.DIST function is often used in analyzing stock prices as normal distribution cannot be used to model stock prices. The normal distribution includes a negative side and stock prices cannot fall below zero. X (required argument) – It is the value at which we wish to evaluate the function. Cumulative (optional argument) – It specifies the type of distribution to be used. It can be either TRUE (implies the cumulative distribution function) or FALSE (implies the normal probability density function). The LOGNORM.DIST function will truncate all numerical values to integers. #VALUE! error – Occurs when any of given arguments is non-numeric. 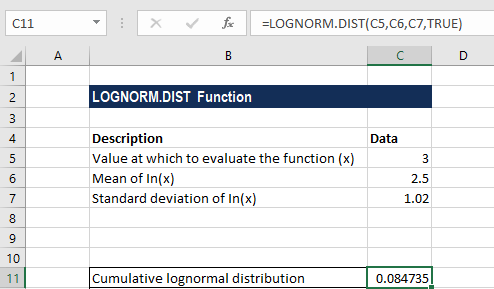 The LOGNORMAL.DIST function was introduced in Excel 2010 and hence is unavailable in earlier versions. For older versions, we can use the LOGNORMDIST function. Check our Free Excel Crash Course to learn more about Excel functions using your own personal instructor. Master Excel functions to create more sophisticated financial analysis and modeling towards building a successful career as a financial analyst.